Saunas and steam baths use heat to supposedly help people lose weight, cleanse the body of toxins, lower cholesterol, relieve arthritis and treat respiratory problems. Saunas are hotter but with low humidity while the steam room has very high humidity and a lower temperature. 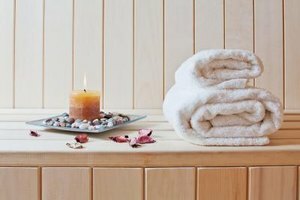 Both saunas and steam rooms are generally safe for a healthy person to enjoy but some precautions should be taken before and after the heated experience. Other than water, eating and drinking can put a strain on the circulatory system and is not advised before entering a sauna or steam room. Both Cyber Bohemia and Mamas Health recommend waiting at least an hour after a large meal. Alcohol and medications that impair sweating should also be avoided due to prevent overheating. All accessories should be removed prior to entering a steam room or sauna. The metal of jewelry will heat up faster and hotter than your skin and can cause irritation or burns. The heat of the room may make skin swell which can also make tight jewelry uncomfortable. Contact lenses may react poorly to the heat, especially the sauna's dry heat, and can cause eye irritation. Cyber Bohemia recommends removing contact lenses before entering. 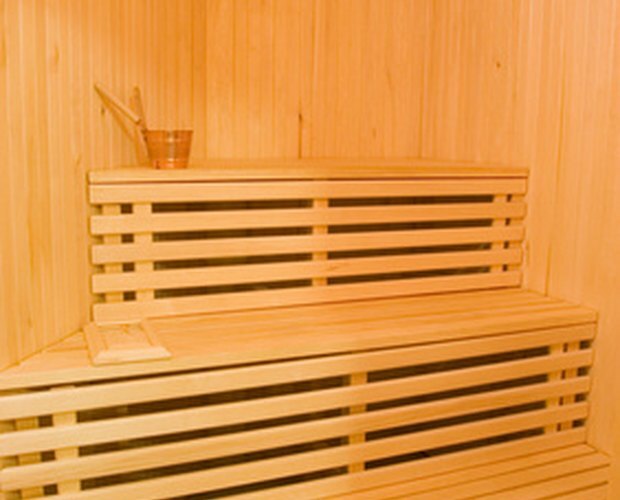 Saunas and steam rooms do not require a large amount of time to reap the benefits. A healthy person should spend about 15 to 20 minutes inside. That time should be shortened if you experience shortness of breath, nausea, dizziness or any other discomfort. Heavy sweating can leave to dehydration so its important to drink water before and after the sauna or steam bath. Harvard Health Publications recommends drinking two to four cool glasses of water after exiting the sauna. Pregnant women, people with high blood pressure, heart problems or circulation problems could experience complications using a sauna or steam room. It is recommend that these people, or anyone with questions about the effects of saunas or steam baths, talk to their doctor before their first session. According to Dr. Simon of Harvard Men's Health Watch, "patients with poorly controlled blood pressure, abnormal heart rhythms, unstable angina, and advanced heart failure or heart valve disease will probably be advised to stay cool." Harvard Health Publications: Are Saunas Healthy or Harmful? Stella Oakley is a writer holding a Bachelor of Arts in history from Georgia State University, specializing in Latin America and Islam. A skilled researcher, she also works in a gynecology clinic and a fitness center.